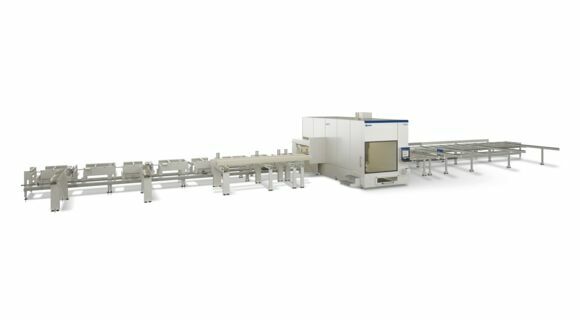 A model for professional implementation is the automatic nesting technology that the Austrian company Binderholz Bausysteme GmbH has adopted by installing several six-axis CNC-controlled "Oikos" machining centres by the Italian SCM. 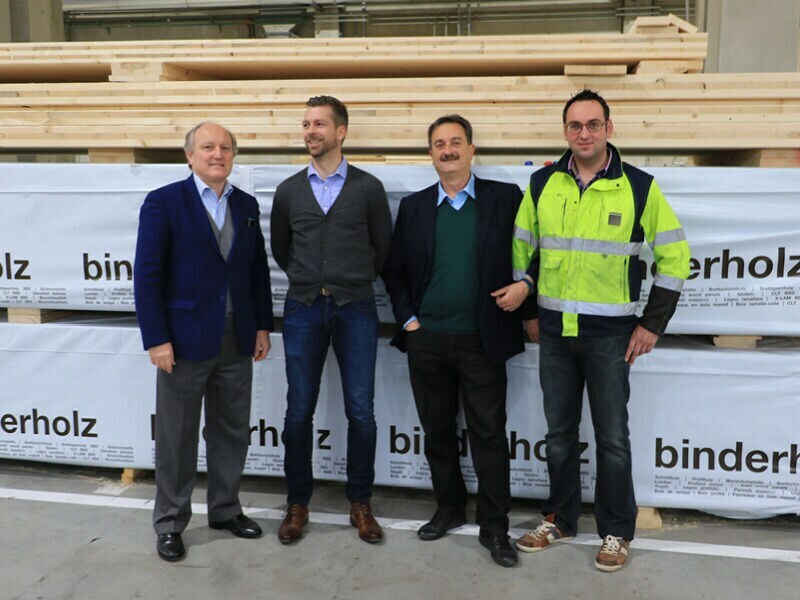 The Binderholz Group, with its five facilities in Austria, two in Germany and two in Finland, is committed daily to demonstrating its advanced expertise in traditional timber construction techniques and in cutting-edge, highly automated production methods. A total of 1,420 employees manufacture a broad range of solid wood products, including lumber, planed wood, profiled timber, glued laminated timber, single-ply and multi-ply solid wood panels, and cross-laminated timber as well as biofuels. In particular, the company’s managers attach the utmost importance to constantly improving production - both creatively and through innovation. This is true both for the materials used and for the smart and flexible production techniques which are also crucial for keeping up with future trends in the BBS sector. As mentioned above, rather than relying "only" pure timber framing, state-of-the-art nesting technology is now used. A perfect synergy for all those involved. During the cycle, the three "Oikos" 6-axis machining centres installed at the factory carry out complete processing of all the BBS-125 elements on all six sides of the workpiece. The working widths range from 50 mm to 1,250 mm, the working heights from 20 mm to 300 mm and lengths of 550 mm to 13,500 mm can be machined. The all-round machining allows not having to rotate or turn the parts and just one operator is enough to operate the machining centre as well as to tool and unload it. There is no need for the operator to be a CNC specialist, because the programming takes place in the process planning stage. The high-speed 25-kW spindle which can reach continuous speeds of up to 16,000 rpm and automatic access to all of the ready-for-use machining tools present in the machine's tool magazine provide for 100%-reliable nesting. The objects are shown in 3D so that every single assembly and joining detail on the workpiece is known at the same time and considered during machining. In particular, the five-axis unit, combined with the sixth sliding axis for all sawing, trimming and drilling operations from below (saw blade diameter up to 600 mm) for any saw cut, together with automatic tool changing, provide for the extraordinary performance of this innovative processing technology. 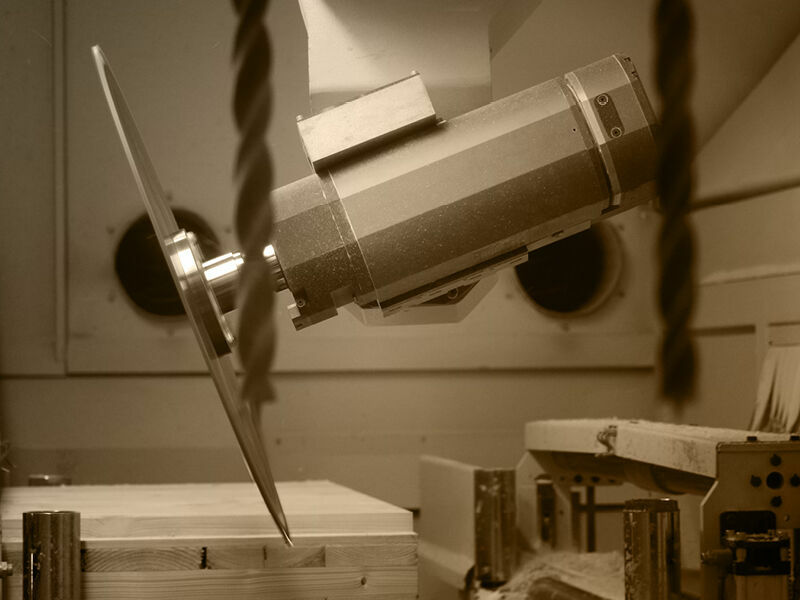 All of the well-known advantages of six-axis technology applied to CNC machining centres can be exploited effectively for almost unlimited machining options. The tools already available in the magazine machine all structural components at any angle and in any position thanks to the interpolating axis movements. Especially the sawing at any angle and in all directions offers remarkable performance features and absolutely new perspectives. Therefore, this means flexible angle cuts on five axes as well as the opportunity to work with the saw blade in almost any position. The fully automated layering and the removal options with forklift truck or crane are also important for cost-effective operation. Thanks to the all-round machining, there is no need to rotate or turn the piece. A successful partnership between Binderholz and SCM, based on the both companies reliability and exclusive know-how.